Tamang Heritage Trekking is newly opened, an unbeaten trail of the Langtang region, This easy trail is a superb introduction to trekking in Nepal, with some of the most beautiful scenery, rich culture, and healing baths in natural hot springs. It gives you an opportunity to explore a beautiful and remote area of the Tibetan border of the Langtang region and at the same time to experience the most unique culture of the local-Tamang people. Tamang, are a little known ethnic group of Nepal, who are believed to be the descendants of Tibetans from Kerung united with Tamang of the Helambu. Their farming communities are generally found on higher elevations, mainly engaging in shifting cultivation and extraction of the forest products. Tamang people are mostly sheep and yak herders, they also grow some hardy grains and vegetables. Their daily life activities include: raising livestock, agriculture, making baskets and mats from mountain bamboo and trading with Kerung in Tibet. During the Tamang Heritage Trekking, you will get a once in a lifetime chance to experience Tamang people native rituals, culture, festivals, traditional costumes and local Syabru dances combined with most pure and humble hospitality. Trekking through the local villages will also give you a wonderful chance to closely study the community’s traditional lifestyle and crafts. 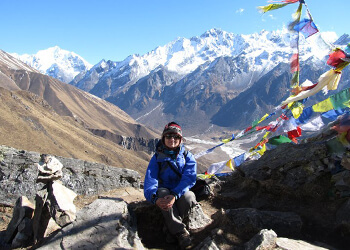 Tamang Heritage Trekking will take you on a journey with amazing views of Langtang Lirung, Langtang Kerung, Ganesh Himal, and other Langtang Himalayan ranges- region abundant in unspoiled nature, local monasteries and green grazing lands full of unique fauna. Langtang Tamang Heritage Trekking region is protected by the Langtang National Park-the second largest national park of Nepal. It offers wilderness experience through beautiful landscapes of alpine terrain, flat meadows and rhododendron forests. This region is a natural habitat of monkeys, bears and countless yeti sightings. The trail of Tamang Heritage Trekking starts from Syabrubesi and continues through Goljung, Gatlang, Thuman, Timure, and Briddim. On the way, you’ll experience a truth beauty of glaciers of varying sizes and high altitude lakes: Gosiakunda, Pravatikuda, Bhairavkunda and Dudhkunda. There will be a visit to a beautiful local Tamang monastery and Parvatikunda Lake at Gatlang. You will also enjoy a gorgeous view from Nagthali view Point and Timure border of Tibet. En route from Gatlang to Chilime, you will get a chance of bathing in the hot, healing spring waters of the natural spring at Tatopani. Tamang Heritage Trekking, with its several, epic mountains; amazing landscapes and unique local culture is an easy-going route becoming very popular amongst trekkers these days. If you are seeking for a great general overview of the Himalaya’s pristine mountain scenery and a wonderful, traditional Nepalese culture we will highly recommend to contact us directly for booking. We will meet you at Kathmandu Tribhuvan International Airport and transfer to your hotel. When you have had your time to settle in and freshen up after your long fight, you will be invited to visit our office for a briefing about your program. You will have the meeting with your trekking guide and discuss the equipment needed for the trekking, and we will process for the trekking permits. If you arrive at night, we will have the same discussion in next day morning after your breakfast. After morning breakfast we drive out along the north-western hills of Kathmandu for about 7-8hr. 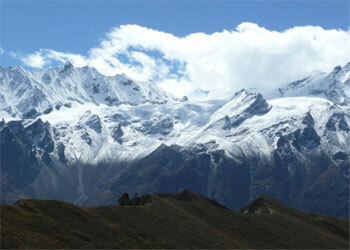 You will witness lovely scenery of white snowcapped mountains like Mt. Annapurna II, Manasalu, Ganesh Himal and other minor peaks along the route and as well as the green landscape of hillock, rivers, and village. Enjoy the Himalayan views and high lifestyle through the terraced fields and rustic villages. The scenery of foothills and ridgeline vistas goes through the Trishuli Bazaar, Betrawati and Dhunche you feel as if you are heading towards low land. We take our Lunch at the Trishuli Bazaar before continuing further Todhunter. We descend to Syabrubesi for the overnight stay. Today’s walk is an easy walk. Throughout the journey, you can experience the local Tamang customs and traditions. The sceneries and the landscapes are worth viewing from the viewpoint as you walk through local villages. The perspective from where we can see the fantastic view of Ganesh Himal, Gosaikunda range, and the Goljung valley. Now we head down to Goljung valley. Today is also a short easy day working for about 3 hrs. Gatlang set high on a hillside among terraced fields is a Tamang settlement. Tamang monastery and beautiful Parvati Kunda Lake at Gatlang are worth visiting places. Upon arrival, the guests will be welcomed by Khada (white scarf of honor), and the homemade local drinks ‘Rakshi’ accompanied by the welcome song in the local language. The cultural show at Goljung and Gatlang makes your unforgettable trekking one. Today would be your longest day of the entire journey for about 7 hours working. The trek leads by descending to Thangbuchet (near Chilime village) by the Bhote Koshi River. Chilime Hydropower dam is worth visiting here. After lunch, the trail ascends up crossing the hanging bridge until you get to Tatopani. On the way, you enjoy the sightseeing of the Langtang range and Ganesh Himal. Tatopani naturally signifies ‘hot water,’ where you can take a hot bath in natural hot springs with bathing areas in the lap of the mountains. It is believed that taking a dip into this spring will heal you from your aches and pains. Today’s trekking provides you an opportunity to experience the Tamang culture. Stay overnight at camp. The trail ascends to Nagthali Danda (3300m), the high open grassland with fantastic views of snow covered the Himalayas. One can enjoy the view and spend some time at the top accompanied by tea prepared by the caretaker of the Gompa. En route you may encounter animals like monkeys and deer. The panoramic view of Langtang, Kerung, Ganesh Himal and Sanjen ranges can be distinctly experienced. Nagthali used to be a famous meditation center for the local monks and priests. We may trek to another cultural village, Thuman, popular for its Shamanic performances and beautiful view of Langtang. It is Tibetan influenced Tamang village with friendly people who love to sing and dance. After short ascend, visit nearby historical RasuwaGadhi. A fort here is a historical reminder of the Nepal Tibetan relations that have existed for many centuries. You can trek to the village of Timure which is an old route to Tibet. Today’s trekking provides you an opportunity to observe Tibeto Burman Tamang culture. You can enjoy the local culture and old traditional livings of people here. Today’s journey is about six hours. The day is comfortable with an almost flat valley path. Experience the village life and enjoy cultural shows performed by communities throughout the journey. Reach Briddim valley which is a Tibetan Buddhist village in the bosom of Langtang Himal. Most of the houses are made up of stone and have roofs of split shake. As direct descendants of ancient Tibetan immigrants, the culture and tradition of Briddim closely resemble that of Tibetan villages. Mix yourself with locals enjoying the homestay and Tamang culture. Day 10: - Rest and exploring day in Briddim. Today is just a rest day in Briddim valley. You can have a short visit to the nearby hills. The landscapes are praiseworthy of the Tibetan plateau. Enjoy the local culture and traditions of Tamang people. The view of Langtang mountain range is also magnificent. This day the trail moves along a gently descending path passing through some villages, terraces and with magnificent views of surrounding hills. You trek from Briddim to Syabrubesi via Wangel village. It is another small Tamang village. Spend your night in camp at Syabrubesi. Today is a pleasant drive day back to Kathmandu with splendid views of hills, mountains, terraces, and villages for about 8 hrs. You drive along the unpaved road until Betrawati. From here drive will be followed along the narrow but very well paved road. Spend your night in a hotel in Kathmandu. Today you will have a free day in Kathmandu valley. Have some rest in your hotel. You can also take a leisurely stroll over the streets and buy some souvenirs and remember from Nepal. At evening we will have a typical Nepali dinner accompanied with cultural shows in Hotel. Pack up your entire luggage and check for anything you left. This can be the last minute preparation to go. We will drop you to the International airport to catch your flight back to your home and wish for your Safe journey. Local transportation to and from the starting and ending points of the trek by Tourist bus/Private Car/Van and Flights depends on Clients requirement and budget. All the meals during trekking three meals a day (Breakfasts, Lunches and Dinners, Tea and coffee). Trekking Permit for Tamang Heritage Trek.